Core+ Stability | GH crane and hoist manufacturer. Effective for both trolley travel and crane travel. Effective to reduce sway due to both acceleration and braking. 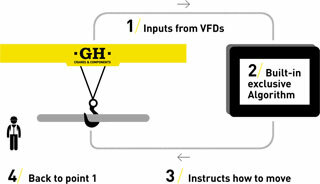 Touch-screen: Easy configuration and crane monitoring (power consumption, alarms, system faults). Easy to retrofit existing cranes. The CORE+ unit is affixed to the electrical panel door. Higher speed + Better accuracy = Increased Productivity and Safety. Hassle-free for operator: System reduces sway automatically..
Commands from operator (accelerate / decelerate). Actual speeds (hoisting, trolley travel and crane travel). Vertical position of hook (given by the hoisting motor encoder). Built-in exclusive Algorithm: Algorithm determines, based on above inputs, optimal acceleration / deceleration rates. Instructs how to move: Core+ Stability instructs VFDs how to perform the movement.